Tennessee has lost another legend. 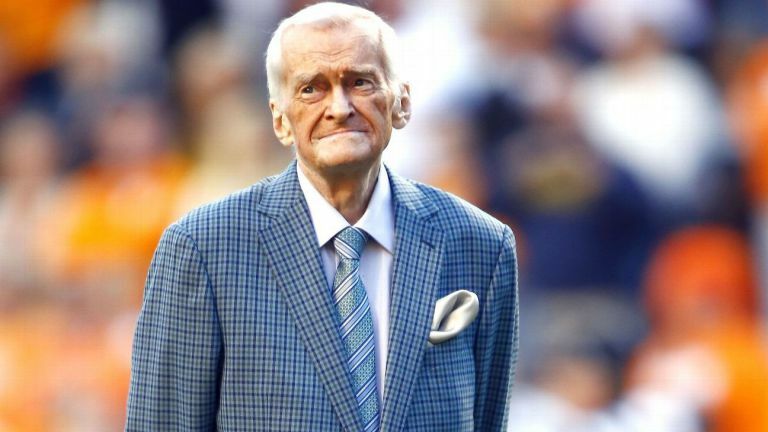 The “Voice of the Vols” John Ward passed away at the age of 88 on Wednesday evening. Ward was the radio play-by-play announcer for Tennessee football and Tennessee basketball for four decades. During that span, he made some iconic and memorable calls during some of the Vols’ biggest match-ups. Take a stroll down memory lane and relive some of Ward’s most enduring calls. The Miracle at South Bend is one of the most memorable games in UT football history. The Vols completed a massive comeback against Notre Dame, overcoming deficits of 21-0 and 31-7 to eventually prevail 35-34. Ward believed Notre Dame had made the game-winning field goal initially, but he realized shortly after that the Vols, in fact, had finished the comeback. Willie Gault was the most dangerous kick returner Tennessee had during Ward’s tenure as the Voice of the Vols. When Tennessee played Wisconsin in 1981, Ward pointed out that the Badgers had never seen an athlete quite like Gault before. Peyton Manning connected with Joey Kent for numerous touchdowns in their Tennessee careers. But one of the most memorable was their touchdown on the very first play against Alabama in 1995. The Vols would crush the Tide 41-14 in that game, ending a nine-game winless streak against Alabama in the process. In Ward’s last season, he got to see two rare occurrences, and the first was a Vol victory over Florida. Tennessee won a thriller over the Gators in 1998, 20-17, and that win would spur the Vols on to an undefeated season and a national title. It was Tennessee’s first win over Florida since 1992. Later in the 1998 season, Ward got to call the first ever BCS National Championship Game, and Tennessee took on Florida State. It would be the last game Ward would call as the Voice of the Vols, and he got to go out on top. Ward was famous for his football calls, but he was just as good calling basketball games. Here’s a look at his call during the last few minutes of Tennessee’s win over Kentucky in the 1980s. Louis Fernandez of WBIR posted a thread of John Ward calls, interviews, and memories on Twitter. Click on the tweet below and you can browse the entire thread.